They still exist, these magical places. Idyllic jewels far from tourist crowds and the busy big city. For unforgettable moments that will say with you for a long time. If you are looking for a location that offers centuries of tradition and combines them with fresh modern style where you can celebrate with friends and family or even celebrate your wedding, the FASANERIE is just the place. Fully renovated and styled in the beautiful colors of pheasants – the birds that give the Fasanerie its name – and under new management since 2017, the FASANERIE has come back to life. The location is excellent: right at the Hartmannshofer Park, not far from the botanical garden and Nymphenburg Palace. 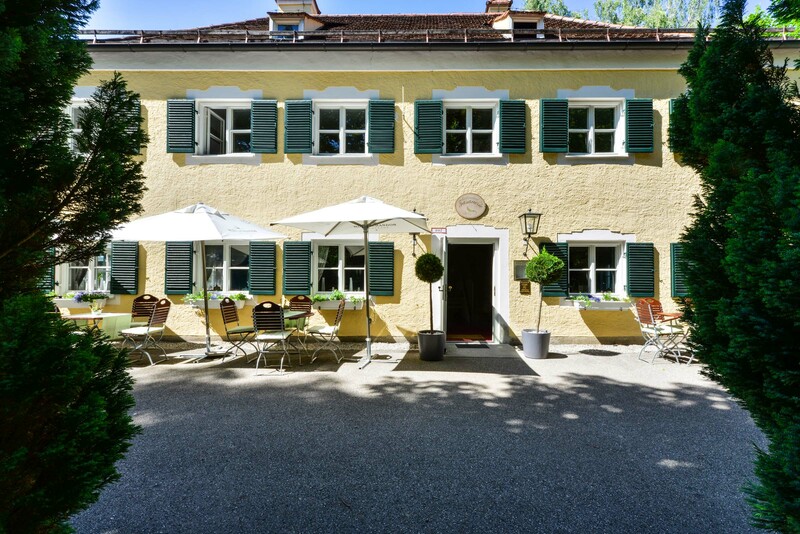 The historic building, once home to the royal pheasant breeding facilities, welcomes you to its beer garden among the typical chestnut trees and a restaurant that combines a long-standing tradition with a modern style. Do you rely on your gut feeling when choosing a restaurant? If you appreciate delicious food as well as a friendly and inviting atmosphere, our restaurant is the place to be! The FASANERIE combines tradition and modern allure – it is down-to-earth and sophisticated at the same time. Our motto „Mediterranean meets Bavaria“ means that we offer you the best of two worlds: classic Bavarian specialties and Mediterranean as well as seasonal cuisine and light food that does not weigh you down. The new interpretations of venison dishes that we offer are a special highlight that suits our historic house well. We buy our quality ingredients from local suppliers whenever possible. We create culinary delights for you to enjoy for both lunch and dinner and server them with carefully selected wines. The small park named Hartmannshofer Park, which is located north from Nymphenburg Palace’s park, can even be considered an insider’s tip by most people living in Munich. The park is always worth a visit, especially since it is home to the lovely beer garden of the FASANERIE – without doubt one of Munich’s most beautiful beer gardens. You can really enjoy your life under the ancient chestnut trees on a warm day or on a nice summer evening. Children love the playground and the small stream, the “Hartmannshofer Bach”. And our guests’ dogs, too, can play and have fun on the large lawn. With a capacity of up to 1,800 seats, all visitors can find their personal favorite place. You can either sit down in the service area or, as is beer garden tradition, you can bring your own food and enjoy it with some beverages from our beer garden counter. Celebrations, parties and events at the FASANERIE in Munich impress everyone with their special atmosphere. Visit us to have your own personal celebration that is simply perfect in every way. What an exquisite feeling to know that you have chosen the right location for a uniquely wonderful celebration and to plan it with this thought in mind. Our house and its idyllic surroundings offer you this good feeling and numerous other advantages. We will gladly plan and host your celebrations, conferences or similar events. Contact our banquet team now and we will make you an offer without obligation right away.